I kicked the week off with gin, so why not continue in the same vein. Today’s blog is another that has been a long time coming – a look back at the highlights of my Ginvent calendar. The Ginvent concept is deliciously simple. The guys at the Gin Foundry teamed up with the team from Master of Malt to create the ultimate boozy Christmas countdown. You can read a bit more about the concept here but I had a fantastic time experiencing a whole range of new gins during the countdown to the big day. And of the 24 I made my way through, these were my favourites. 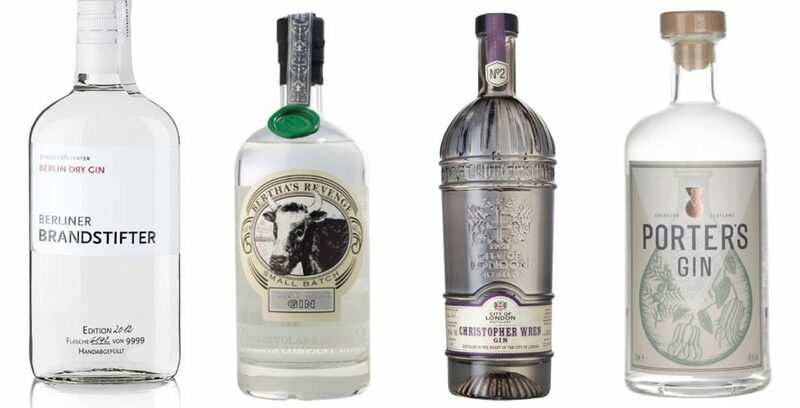 Here’s an interesting one to kick-off with – a gin made using whey alcohol from Irish dairies as its base. Milk from Irish dairy farmers is separated into curds and whey, with the later traditionally regarded as a waste product. But the team at Bertha’s have used special yeasts to convert the milk sugars into alcohol, before distilling it with 18 different botanicals. There was a big nose on this one – extremely spicy, a blast of ginger, cardamom and a hint of pine. The palate had juniper to the fore, with the gentle warming ginger to the rear, with a mouthfeel reminiscent of orange oil. This special edition has been created in collaboration with Tom Nichol – Tanqueray’s retiring Master Distillery. The full size version is housed in a bottle reminiscent of Wren’s most famous creation – St Paul’s Cathedral – and with just five botanicals, demonstrates an extremely high level of skill. The overriding notes on the nose were of juniper and orange peel, with some coriander too. It was also extremely clean, whereas the palate was beautifully smooth and rich. The juniper and orange peel were there too, along with a slight peppery bite. Porter’s Gin lays claim to being Aberdeen’s first distillery in more than a century. Named after Professor Andrew Porter of Aberdeen University, who sourced the team’s rotary evaporator, the team use a mix of vacuum distilling and traditional copper pot distillation. I was obviously growing weary of Ginvent by this point, as my notes say “Smells like gin – a good start!”. But there’s more – I got some light orange and earthy coriander, with some elegant juniper too. The palate was delicious – smooth, yet robust. Lots of juniper, orange peel and peppercorns. I’ve been reliably informed by a German colleague at work that this roughly translates as Berlin Arsonist – an indication of the gin’s intent, perhaps? Interestingly, each botanical element is macerated in a German wheat distillate for a week, then distilled separately, before being blended together and reduce to 43.3%. After such a complex process, I’m slightly embarrassed to admit that all I could get on the nose was Shloer. But, you know – who doesn’t like Shloer? I was clearly in the festive spirit by the time I tasted this one, as I described it as “dancing across my palate like a sugarplum fairy”. It reminded by of lemon sherbets from school, although there was plenty of juniper and a bit of pine too. I’d never tasted, or even heard of, any of these gins prior to Ginvent, so I hope this gives you some new botantical beauties to place on your “must try” list. And with Advent starting in less than six month, it’s never too early to start saving your pennies and get involved with this year’s countdown. My Ginvent Calendar was provided by The Gin Foundry.